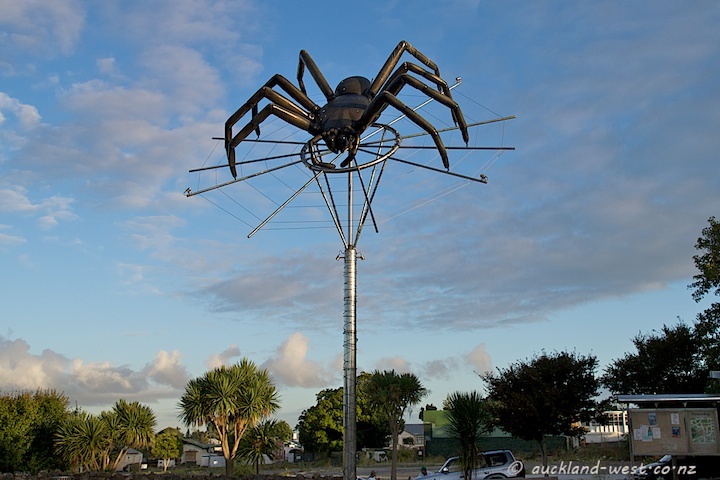 Affectionately known as “Dale”, this is a monument to the Australian immigrant (from the 1920’s) huntsman spider (Delena cancerides) which seems to have settled in the Avondale area, and therefore is called the Avondale Spider in NZ. Probably our largest spider, its body size can reach over 4cm. Despite its fearsome appearance, it is quite harmless. 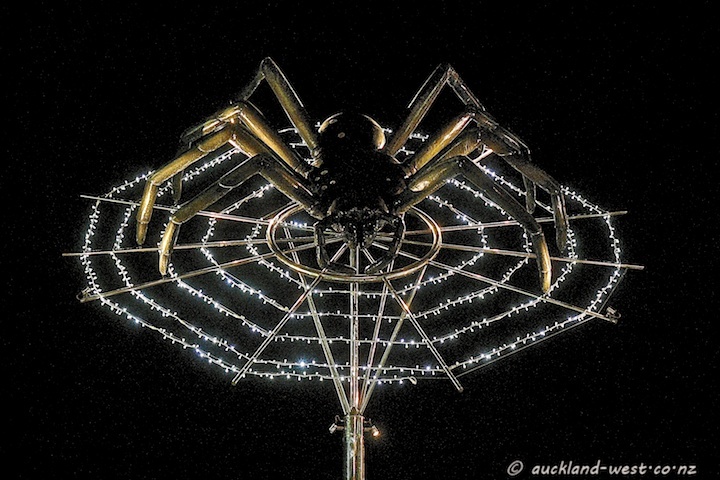 The illumination of the spider’s web seems to be a recent addition, maybe for the Rugby World Cup? (Which reminds me: there is a game tomorrow against France – Go the All Blacks!). Spiders are fun. And this really is a big one. Now THAT is a spider!! Wow! But, hey, he looks terrific against your beautiful skies! Fun, terrific capture for the day, Paul! Hope you have a great weekend! Some people are grossed out by spiders, but not I. I rather admire them. However, I might think twice about my admiration if I met a real one this big! How wonderful that it is not poisonous and harmless!! Excellent photos, especially I like the first one. Dale is 7 years old and attends Avondale Primary School,As he is nocturnal, he attends night classes, he has his own Library card and allways wins the 3 leged race at sports days. Avondale celebrates his birthday every year with a giant birthday cake and hundreds of fellow school kids dance around his pole.The lights are to stop planes crashing into him. He felt unwanted in Australia so came here to live and is now an NZ citizen (so you Aussies out there can’t claim him) he is the international movie star of Arachnophobia and Spiderman. He is around 5 metres accross and mainly eats flys.